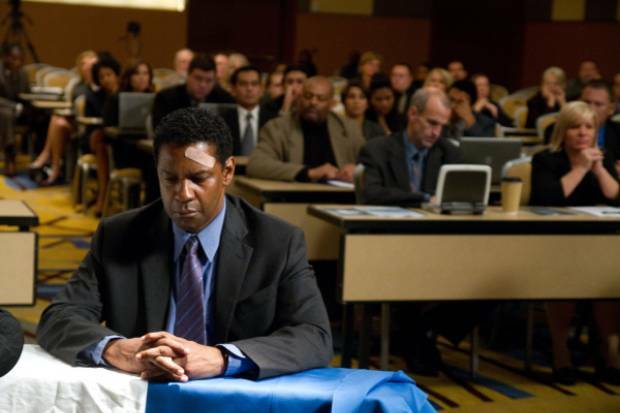 Denzel Washington is once again responsible for saving many lives on board a large vehicle in his latest film, Flight. But this time, not everyone survives the calamity. And even Washington himself is permanently damaged. But not in the way you may think. In the Robert Zemeckis-directed film, Washington plays Whip Whitaker, a hard-drinking yet decorated airplane pilot who, when we meet him, is about embark on a life-changing journey. On the eve of a flight from Orlando to Atlanta, Whip drinks heavily through the wee hours of the morning and even does at least one line of cocaine with stewardess Katerina Marquez (Nadine Velasquez) before sleeping a wink and heading off to the airport. Though those ill-fated actions are presumably routine for his character, they were no match for what was facing him once he boarded the plane. Quickly the plane begins to fall apart and heads for a nosedive at extreme speed. But being the accomplished pilot he was, Whip is narrowly able to land the plane relatively safely in a vacant field with just a few major injuries and 96 out of 102 lives spared. If this sounds like a heroic occasion, considering what he was up against, well, it is. But the audience is left questioning whether he would have been able to land the plane if he hadn't been on his "uppers," or whether the plane would have been in trouble at all if he hadn't been under the influence. Whip's defense? Faulty mechanics. Never mind that this deeply flawed character has done a very commendable thing. It's that he didn't follow the rules, even flying the plane upside down at one point. He reeks of intoxication and arrogance and, as we see in the movie, his family life is not winning any awards either. But even his professional associate Charlie (Bruce Greenwood) and surviving co-pilot Ken (Brian Geraghty) say he performed a miracle. This tremendous pressure for Whip, who continues to spiral further downward both personally and professionally when he takes in a fellow lost soul, Nicole (Kelly Reilly), on the brink of his criminal investigation. This character, while excellently played by Reilly, further allows the audience to peek into Whip's internal demise and see just how empty his life is outside of being a pilot. But even as we see that, it's hard to feel any empathy for this character. Even though there are several people in his life who do sincerely root for him, including Charlie, Nicole and even his attorney Hugh Lang (Don Cheadle), his antics and outbursts continue to damage is image and cloud his accomplishments. Simply put, we begin to not care what happens to him either way. This brings the film back to the interesting question discussed above: What's the grace period for celebrating a hero? In Flight, it lasts about the extent of a hospital stay. By the time Whip is released from from the hospital, his face is splashed across the headlines while at the same time the investigators and airline board is hot on his tail to get to the bottom of what really went down on the plane. How hard is it to praise someone who is so worthy of your denigration? This skepticism is more apparent in Washington's scenes with Reilly, whose character shares a pendant for recklessness with Whip though hers is more of the self-inflicted kind. Whip wallows in his guilt, making it hard for anyone--including his own son--to want to get close to him. Reilly's nuanced portrayal, however, is so magnetic that she sometimes upstages Washington's often sinewy performance. Washington is certainly no stranger to playing fallacious characters, especially in the latter part of his career, and this one is no exception. While his performance here is perhaps not as introspective as it had the potential to become, but it is off kilter from his more usual fare these days making it that much more memorable and compelling. It would be re-missed not to mention, though, that Washington retains his obvious New York accent as this character that the audience assumes is from the south (his father's home is somewhere in Orlando, where his ex-wife and son also live). Zemeckis, who is not immune to capturing severe strife in his characters (Cast Away, Forrest Gump), masterfully directs the film (including the fine musical score), up until the last, say, fifteen minutes. In that time, we finally get to see Whip's nuance that we've been waiting for the entire film. But, by then it seemed a bit tacked on John Gantins' screenplay. We had grown to accept Whip's deviance and was quite satisfied with the character study prior to those final last moments. In fact, what precedes that could have actually been the end of the movie. This doesn't necessarily take away from the film, but it is worth noting, as a more provocative alternate conclusion. Good review Candice. I liked it because of Washington's amazing performance, and how it didn't really present me with a story that was all that clear-cut in the first-place. You actually had to think about a lot here on what you consider right, and what you consider wrong. This films trailer really undersold it, leaving me disinterested. After reading wonderful reviews, like your, I just can't help but want to see this. Sounds like a strong bit of filmmaking. Great review! I agree with you about the ending sort of feeling tacked on, yet not really taking away from the film. I also thought the trailer undersold the film. It was a lot deeper than I was led to believe; I'm so glad I didn't let that stop me from seeing it. The trailer was wholly misleading in my opinion to get people in the theaters. The film is much darker than the trailer purports. Great review Candice. I think the film had an outstanding supporting cast including the always dependable John Goodman. Unlike you though I feel like everything was leading up to the ending. Without that last 15 minutes you really don't have the full story. The journey would not be complete. It's also the scenes where Denzel gives his finest performance in the whole picture.